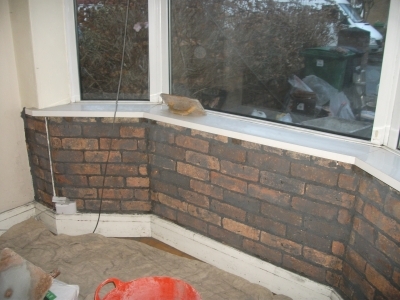 A front bay of a 1930s 11” cavity, cavity constructed type property in Barrington Rd Whitchurch Cardiff. The existing bitumen felt dpc has broken down allowing moisture to rise up through the structure depositing salts on the surface. 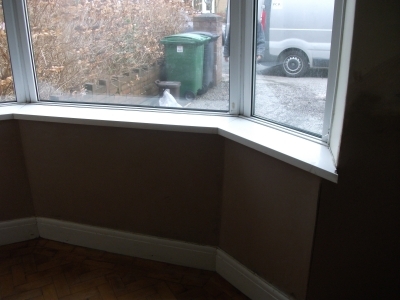 Storm has removed the existing defective render to approximately 1.2. meters high. Installed a chemical dampcourse to British Standards BS.6576.1985. 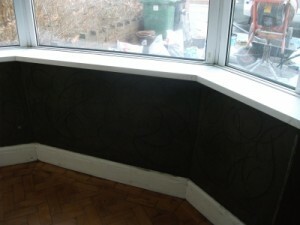 Storm finish the work by undertaking the associated rendering and plastering to there specification. It is important to note after the wall is plastered, to delay decorating for as long as possible to allow for the drying out process. If you have a problem with damp, let Storm damp proofing give you a free estimate on repairing the damage. We service the whole of the South Wales area including Aberdare, Abergavenny, Barry, Bridgend, Blackwood, Bargoed, Caerphilly, Cwmbran, Clydach, Cardiff , Ebbw Vale, Llantwit Major, Maesteg, Mountain Ash, Merthyr Tydfil, Newport, Nelson, Neath, Port Talbot, Porthcawl, Pyle, Penarth, Pontypridd, Pontypool, Risca and Swansea.